The tobaccos we have elected for Fred Original Blend are quite distinctive and contain more nicotine than those present in the Special Blend variant. Thanks to its unique humidity regulation system, Fred tobacco will remain fresh for months! Until recently, we were struggling deciding how Fred Original should taste. It had to fit in Fred taste direction but also provide a distinctive character that roll your own smokers are looking for. It would be indeed too easy to copy what we have done for cigarettes. 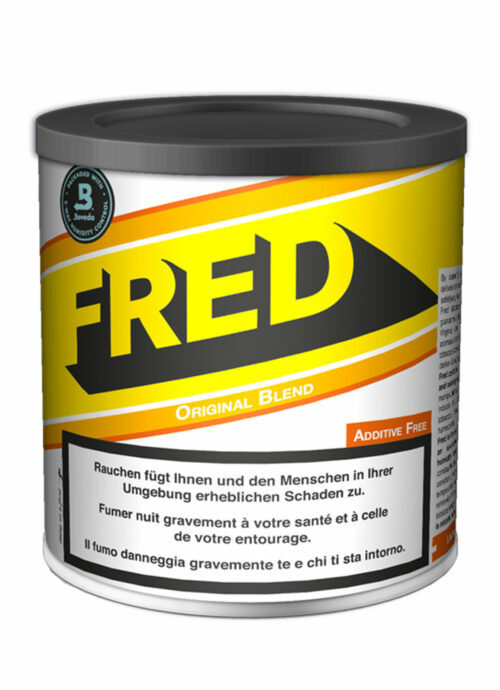 We are now pretty confident that we found the proper recipe: like all Fred family members, its taste is very balanced but unique Oriental tobaccos add spicy notes which will develop behind your cheeks; it is subtle but unique to Fred Original. Virginia from the US is also more present to add sweetness to the blend. Fred Original is quite complexe and targeted at the connoisseur able to perceive the different taste layers it offers. Enjoy!